My hapless wanderer (let's call her Alice) escaped the Wold forest only to stumble upon a large, featureless and dusty plane, at the center of which lies Castle Morrow, a fort populated by mechanical servitors and a single live member of a rare cult of Chronos. Alice's ignorance of local custom and her natural inquisitiveness have predictably landed her in trouble (again), and now she must fight the human Chronos cultist. Since, as all females her age in her society, she's a 6-dan black belt martial artist, that would not normally be a significant challenge. However, there's the slight snafu that the Chronos cultist is precognitive, in that he can almost without fail predict Alice's every action up to 6 seconds in advance. He achieves this thanks to the Mind-machine-interface that links him to the Chronos Oracle AI, which has nanomachinery infusing the very walls, water, food and and even air of this cursed place, measuring almost everything that can be measured every nanosecond, and constantly updating predictions based on that. I would love to have Alice draw in the fight (the cultist is quite skilled in combat too), but I keep coming up with suboptimal solutions, that a rational and moderately intelligent precog would foresee and prevent. EDIT: I should probably specify that Alice is NICE, so she would prefer to avoid KILLING people if at all possible. So, how can Alice defeat this precognitive warrior? LATER EDIT: Lots of great answers, wish I could accept at least 3. My solution will likely be a combination of @MasonWheeler's ambiguous move answer and @Keith's quantum randomizer, with a sprinkling of @Samuel's paralytic poison caught by the oracle. begin a strike towards him that could be completed in two different ways, without actually committing to either one. He saw her about to make both attacks, but was only able to block one or the other, so he had to make a choice. She saw him commit to blocking that one and made the other attack, and so was able to get through his defenses and defeat him. It's hard to see how "a rational and moderately intelligent precog" would be able to beat this strategy. If the poison takes longer than six seconds to take effect then by the time the warrior sees his own incapacitation looming, it's too late to change it. Make it a paralyzing poison, or one that interferes with the BCI (Brain Computer Interface), etc. There is nothing the warrior can do to avoid this. The warrior thought that the glancing blow Alice landed which allowed him a solid hit was a fair trade, until he realizes that's all she needed. I imagine this would make an excellent scene as the realization dawns on the warrior's face and he looks in horror at the small scratch he was just scoffing at. Your description and comments seem to imply that Alice will not be able to overcome the cultist with any single sequence of attacks. So, she'll have to use a long-term strategy defeat him, where no six-second sequence of events gives Alice a clear advantage, but she gains one when they are all combined. In particular, she could use the rope-a-dope. This strategy, famously pioneered by Muhammad Ali against George Foreman in the Rumble in the Jungle, involves a boxer allowing himself to take body blows while leaning against the ropes to absorb the blows and tire his opponent. In general, it means taking a defensive position and coercing the opponent to overextend or exhaust himself. Using this strategy is how Ali was able to beat Foreman, even though the younger and stronger Foreman was the favorite by at least 3-1. To start with, Alice should play it safe. Use quick, low-risk attacks where the opportunity arises, but otherwise keep her distance and focus on defense. Also, she should hold back a little, not showing the cultist the full range of her skills. If she keeps him on the offensive and successfully blocks or avoids most of his strikes, then she should be relatively unhurt by the time he starts to tire. As the cultist becomes fatigued, he will move more slowly. Eventually, he will slow enough that even with precognition, he won't be able to stop or counter all of Alice's attacks. A flurry of strikes should be able to get past the cultist's defenses. A precognitive fighter could fall victim to this strategy, because each successful attack he makes is an advantage to him in the short term, and he might not see the long-term risk. While this question is fantasy-based, this answer is reality-based in that it doesn't require that the hero know about the AI at all until after the fight has started, if at all, and doesn't require any magic or unusual equipment. As a martial artist (a red belt/4th kyu in Shotokan karate and hapkido), I have fought dan-grade black belts. The difference is not as great as many people seem to think, and is on the order of perhaps a tenth of a second and the sheer variety of things that they can do and counter. Attack a high-ranked martial artist, and it is likely that - precognition or not - they will have experienced that attack before and can defend against it. On the other hand, I have scored hits against my sensei, who is approaching the rank described in the question, however it is a matter of probability, and the probability is that for the most part, I'll be hit more often than I'll score a hit. Also, I've fought dan-grade juniors (under 16) as a red-belt and below, and as an adult in my 40s, they aren't much of a threat - they can execute all the techniques better than I can, and they know more, but they can't string it all together for as long - they lose the plot after a few techniques, while I can keep planning and acting while they lose their concentration, so as long as I can hold off their initial attacks, I'm pretty sure I'll score. That's why there are age groups in tournaments. Now, depending on the skill of the chronos cultist - which may not actually be nearly as high as Alice's as he would have been relying on precognition to deal with similar ranked or lower ranked opponents, thus actually reducing his chance for independent learning - it may not actually matter that the cultist has precognition. The first likely option that I can see if Alice is indeed capable of defeating the cultist hand-to-hand is that the cultist runs away or surrenders immediately, having been told by the AI that he can't win, precognition or not. The second option is that the fight will take longer than six seconds. One of the exercises we practice involves fighting six to ten other fighters one after the other, ten seconds for each other opponent. During those ten seconds, there may be a lot of hits scored, or none at all, however fighting non-stop for that time can get pretty exhausting. In a fight between high-dan martial artists (or those who can act as if they were), there may be quite some time of exchanging ineffective and only mildly effective blows before the telling blow is scored. Unlike in tournament fighting, real fighting is not to the first touch. An opponent may score a hit that was mostly deflected. Also, there are rarely any breaks while the judges call out the scores. So, our two martial artists might be fighting for some time. In my dojo, black belt (0-dan) students must fight for ten minutes non-stop in grading. Can the Chronos cultist match that kind of endurance? It is unlikely, given that he'd probably win most fights in the first 6 seconds. He would probably have trained, but he would be training for strength, to get his blows out faster, rather than for the endurance to outlast an opponent, given that he'd be used to winning quickly, and any injuries he might take would be from faster opponents. The pair square off and begin circling one-another. The AI tells the cultist that this fight won't be won quickly, but the highest order of probability to inflict impairing damage on Alice is to do X, Y, Z and so on, which the cultist dutifully does, immediately going on the offensive. Alice may or may not actually take any hits, but they'll probably be minor if she does at this stage, and she may score some similarly minor hits of her own. This rapid exchange of blows would continue for some time, potentially up to a minute, and all the while both fighters will be getting tired. However, Alice, having better training, would have longer endurance, and the gap between the cultist and Alice will gradually widen. Alice will begin scoring more and potentially better hits as exhaustion begins to slow the cultist more than it slows her. As Alice observes the cultist slowing due to exhaustion, she can begin going back on the offensive. There is a difference between knowing what an opponent will do, and having the ability to counter that opponent, and despite attempting all the correct counters, the cultist will take more and more minor and less-than-minor hits. Then, the AI will realise that in six seconds the fight will be over, with the cultist as the loser, and there is no way out of this situation, as the AI/Cultist lost almost a minute ago, as the cultist's level of exhaustion passed the point where victory or escape was impossible, however the ultimate conclusion took more than 6 seconds to foresee. As the AI has foreseen, Alice delivers the final, telling sequence of attacks that fells the cultist. I would say information overload. He's still human. 6 second prediction is great if you want to avoid getting a bullet, a knife or surprise punch. You should never be surprised. However, you have to be pretty good to both plan a defense 6 seconds ahead AND execute it at the right time. Fighting against me would be easy to defeat, likely not even needing much in the say of prediction. But a highly trained marshal artist, can attack about 5 times (WAG) faster than I could, and likely keep it up. Knowing she's going to punch at your gut, kick at your head and try to sweep your feet over 2.5 seconds, leaves you with the option to pick which one to accept. The information coming in could distract from the actual combat happening, and unless he practices this type of fighting a lot it will eventually get him into trouble. On top of that by being able to react to a move before it happens, he is changing cause and effect, meaning that the attack predicted 6 seconds earlier might be changed in that time frame. Either things can change, or he will just know how it ends ahead of time. EDT: After rereading the question, I realized it was an AI with 'predictive' capabilities, calculating future events based on current variables. Not seeing the future, not reading minds. This leaves an opening I missed, at least I didn't take full use of it before. A really well trained hand to hand combatant isn't thinking about many of their moves, at least not like I would be. They are responding to stimulus in a proscribed manor, which allows for insanely fast reaction times. So the first item would be if 'Alice' knows several fighting techniques and at least one of them is not known to the AI, then by changing techniques she could really throw off the predictions. Especially if it is a new technique. Add that to just attacking fast and the human will fail enough to allow the possibility to lose. Well, one major theme in video gaming (I'm an avid gamer) is that, even if you KNOW what your opponent is doing, if they have better skills, mechanics, and speed you still have a huge chance of losing. For example, map hackers in StarCraft II: they may be able to see your base, where your army is, etc. But if you have superior mechanics (you are more consistent with building your base, expanding, microing your units), you still have a good chance of winning, despite their superior knowledge. Obviously, if two opponents are equally matched, the one with superior knowledge wins. However, you say she is very good in combat, but that the cultist is "quite skilled too", meaning he is good, but maybe not as good as her. This would lead me to believe she could conceivable fight him to a draw just based on her superior mechanics and speed alone, even if he can predict her moves. Also, you mention that the precog occurs not through telepathy, but through basically an AI that is reading the ENVIRONMENT and making PREDICTIONS about what will happen. This isn't exactly true precognition, as the AI can't READ HER MIND and know exactly what she will do. It can PREDICT, based on her movement patterns, etc. But really, it just means that the warrior would just have extremely good REFLEXES, not necessarily being able to KNOW exactly what Alice will do in the future. Furthermore, it stands to reason that the AI could predict incorrectly. Especially if Alice catches on to the fact that the AI is predicting her moves and she starts acting erratically on purpose. Seems to me that this is a standard game theory problem, like say rock-paper-scissors (RPS). If your opponent can predict your move in RPS, you will of course always lose. For that reason, one way to play for a draw is to always play randomly. For your scenario, Alicia therefore needs a technique in which the actions she is going to follow are simply not fixed in advance. The AI can not therefore plan counter moves. Now, depending on your setup, you need a way to achieve this. Firstly, Alice needs a way of fighting without moves being planned. Secondly, ideally she has a fully non-deterministic method of determining her actions - such as a handy quantum device flashing colors to which she reacts. More mundanely, this problem is related to cryptography. If the AI cannot actually read her mind, can she memorize a long non-repeating of keys to define moves? This is a bit like using a one-time cipher. And if she really wants to work hard, she combines the two. The current flashing color and memorized element in the cipher together determine the action to take. Overwhelm him by sheer concentration of firepower! If you throw a paralytic dart, he can duck. If you throw 10 paralytic darts in a cone-filling pattern, he can't duck. If he somehow manages to duck, he's probably standing on one leg, balanced in some hugely unlikely position. Just throw 10 more. He'll eventually tire of acrobatics. Perhaps he'll use the 6 seconds to grab a shield. Too bad. His shield likely can't cover both his feet and head at the same time. Vulcronos mentioned it, but stamina. Suppose the cultist can predict every attack and block or avoid it. Suppose Alice has excellent reflexes and experience of sparring, so for practical purposes she can also block or avoid his attacks (she doesn't predict them 6 seconds in advance, but she does see them coming enough of a fraction of a second ahead to react). Note that although he can predict her attack 6 seconds in the future, he can't just step aside 5 seconds in advance and stand there while she spends 5 seconds winding up to punching empty air. Why would she do that, unless the precog magic also forces her to hallucinate him doing "what he would have done if he hadn't had the precog"? Her attack occurs in response to what he does during the period he precogs, so the prediction must be made on the basis of knowing what he will do too. So, having 6 seconds of precog also commits him to (6 seconds minus her reaction time) of his own decisions. As long as she knows to be super-cautious, and is significantly better than he is, then there can plausibly be no flaws in her defence that precog can exploit. If I go at a tank with a baseball bat it really doesn't matter whether I have precog or not, there is simply no move available to me that knocks a hole in it. If they start out in stalemate, then whoever gets tired loses eventually. If I'm fighting a heavyweight boxer, it doesn't do me much good to know when he's going to punch me. I'm still going to expend a lot of energy making him miss, if I can at all, and my best attempt at a guard will still leave me concussed in short order because I'm simply not strong enough to take a heavyweight's punch with my raised gloves, at least not reliably. But I can't box at all: this cultist is a lot better than me, so he needn't just get pummelled. The cultist won't know he's lost until 6 seconds before she makes a move that, despite his foreknowledge of it, he is simply too exhausted and slow to get out of the way of. He's a big man, but he's out of shape, and for her it's a full time job. It's also entirely plausible that straight off the bat she could perform some manoeuvre that defeats his physical ability despite his precog. I remember as a young kid trying to jump double sweep kicks from a friend who'd just learned them at karate or whatever. I knew they were coming, because he told me and did it pretty much the same every time, but I still tripped over him about 50-50 because I wasn't timing my jumps correctly. Naturally that particular move wouldn't beat the cultist, since I was only trying to jump both kicks for fun: to avoid them I could have stepped back. She'll need a better move. So maybe this cultist precogs himself flat on his back and her punching his lights out: what's he going to do with that information if he's already engaged with her when it arrives, 6 seconds before the end of a 7-second fight? There are martial arts which actually target the kind of operation you need to defeat such a superior adversary. The key requirement is redefining "defeat your opponent" to mean "accomplish your goals" rather than "prevent your opponent from accomplishing theirs." This is likely met by your desire to have a "draw," so it should be along the lines you need. There is a legend of two great fighters who came to an arena. Neither had known their equal. Both fighters stood there, for two days and nights, motionless, looking for a weakness to exploit. After two days and nights, finding no weakness in the other party, both fighters saluted, and went their separate ways. The opponent does not have infinite control over the world, even if it is infinitely observant within 6 seconds. If it exerts will over the universe (as all minds with agency do), you may oppose it with your will, accept the effects of their exertion, or a "third option." Consider an opponent which wishes to keep his punch moving forward. He is exerting some of his finite control to do so. If you were to push sideways hard enough, he would feel the need to resist your push to keep his punch on track. However, if your force is slight, he may accept your will and allow you to move his fist slightly to the side. After all, the punch is still on line. However, doing so has changed his structure ever so slightly. Now his muscles are no longer quite as aligned with the punch's motion. So you can apply a little more will, deflecting it further. If it isn't worth the expenditure of control to resolve this with his now off-axis muscles, it is in his interests to let this happen. Maybe he can still get a glancing blow. As long as it looks like he can get something (like a glancing blow) within 6 seconds, the option looks good to him. If you can give him nothing but oppertunities which are good for you and are indistinguishable from "good for him within the next 6 seconds," he has no reason to oppose you, and you can go about accomplishing your goals. This would create a combat style which does not initiate strikes, as much as nullify them. It would appear that every incomming strike is responded to with a block or deflection, but no ground is given. Strikes would occur, but they would be done simply to "keep the balance," ensuring the precog cannot deliver a deathblow without failing to avoid a deathblow directed at itself. In the end, Alice does not "defeat" the Precog. She merely gives him as many opportunities to realize he doesn't need to fight her, and eventually takes her up on one of those opportunities. Consider that this is not as fanciful as it might seem. Have you ever entered an area (say, a bar), and immediately gotten a vibe that "this is not a good place to be." These vibes often occur minutes before things go bad, not just 6 seconds before. Thus an Alice that concentrates on those "vibes" could easily see more than 6 seconds ahead. Six seconds may not be enough time for the precog warrior to see tactics being used by Alice. Much like chess, advanced martial arts is more about thinking ahead and placing the pieces (you and your opponent(s)) where you want them so that a final strike simply cannot be avoided. So like the answer from m t above, superior skill from Alice could win the day. It doesn't matter if your enemey knows what you are going to do if they can't stop it. This is a particular problem in close range low reaction time fights. There just isn't much time to plan a counter attack that takes advantage of your knowledge. Also, anything the cultist does to counter Alice will change what she is likely to do. A lot also depends on exactly how good of a fighter and how strong the cultist is. Alice could attempt to wear down the cultist if she is fitter then he is or beat through his defenses if she is substantially stronger than he is. She could also plan a victory more than six seconds in the future. For example she could make it look like she is losing in order to lure the enemy near a corner to pin him down in, let him manuver her to the ground only to trigger an attack over her head using some mechanism she has. A pyrrhic victory is also possible, she could release a sleeping gas to knock them both out, assuming she will recover first because of her training or age, or that the afteraffect of the drug will take more of a toll on the cultist prediciton powers than on her. In an extreme case, she could threaten to do something that would kill them both, like release a killer beast or trigger the robots to cleanse the castle of all living things, (cultist always have murderous beasts or doomsday triggers lying around in their mechanical castle, right?) if they don't stop fighting which would give you the draw you want. The Warrior is still (presumably) somewhat human, with human-level data processing capability. So while the Oracle can predict almost everything Alice can do, it can't communicate literally every possibility to the Warrior - it has to pick and choose what it thinks is useful. For example, it's unlikely to tell the Warrior that Alice might end her backward flip by breaking out into the Macarena, even though it calculates that as a non-zero possibility. That would just be a waste of the Warrior's cognitive capacity and bandwidth - even if he can receive the information, he can't necessarily process and make optimal decisions off of it. So Alice's strategy should be to make a series of moves that are sub-optimal enough that they won't be communicated to the Warrior, and will eventually create an opening. She should also include occasional optimal moves to help the confusion. Preferably Alice would utilize a perfect random number generator to help her plan this assault, but I recognize that she's unlikely to have one on hand. The Warrior should be shocked by having something unexpected happen, which will create openings for her to exploit. The Oracle, of course, can recognize what's happening, but still has limited options. It can't communicate every possibility to the Warrior, or he'll drown in information overload. So it's mostly stuck - it can try to pick out some sub-optimal possibilities to communicate, but if Alice's attack is random enough it won't be able to successfully predict which moves she'll actually take. These unexpected moves will serve to narrow down the Warrior's future vision, to the point where he can only predict 1-2 seconds ahead. At that point Alice can check-mate him, where she's able to disable even with his perfect foreknowledge of her actions. Alice could set off a portable EMP, thereby knocking out the AI's nanomachinery in a radius far larger than her opponent can move in 6 seconds. Now that he's no longer precognitive, she can proceed to disable him with ease. Alice could pull out her homing nano stun missile, which always unerringly finds its target. As it is impossible to dodge, it doesn't matter how much of an advance warning the cultist has - he will still be incapacitated. Building on Nathan Reid's answer, Alice should attack the nanite swarm rather than the warrior. To do this, she needs to saturate her fighting clothes, wristbands, headband and shoes in a magnetic powder. As she strikes out at her opponent the powder will break free and cloud around her. Every time her opponent successfully strikes her, great puffs of the powder will billow up into the air. Then because of its magnetic properties, it will immediately collect around the tiny metal robots, effectively binding and blinding them. The longer the two humans fight, the blinder the AI will become. Can AI's get scared? What does an all-seeing AI fear more than blindness? How will your precognitive warrior react when in the place of its usual unemotional predictions, the AI starts screaming? There are problems with this answer. Most notably it requires that Alice who was recently ignorant of local customs, suddenly become extremely knowledgeable about the nature and source of the warrior's precognitive abilities. Secondly, this strategy relies somewhat on surprise which may be hard to come by within the domain of the warrior's kingdom. For if the nanites are really watching from everywhere in the kingdom, then the AI is not only fore-seeing but also all-seeing. The ability to know everything that Alice did during recent hours, preparing for the fight, is at least as strategically valuable as knowing what she is going to do in the next six seconds. To defeat these problems, Alice (or someone influencing Alice) must know about the precognitive warrior prior to her arrival in the kingdom, so that she can arrive with her fighting clothes already saturated in magnetic dust. If it were my story, I would leave her ignorant and make her new fighting clothes a unexplained gift from the Wold Forest. What does it mean to see 6 seconds in future? Prediction is tricky - there are quite a few feasible ways how an Oracle can get, say, 90% correct predictions, or conditional predictions (If X, then Y) but if you assume 100% correct unconditional predictions then it means that all future is predetermined and unchangeable, therefore no strategy can change anything at all. In particular, it would be reasonable to have a precognitive warrior that predicts "ah, Alice will initially attack with a 'surprise' blow to my knee" or a warrior that predicts "If I try to attack from the top, she will block me in this particular way and then counterattack me in that particular way." It would not be reasonable to have a precognitive warrior that predicts "she will block me in this particular way and then counterattack me in that particular way, no matter what I do or say" - simply (unless everything, including the final outcome is already predetermined) because the future depends on his actions as well. His precognition of the future alters the present, and thus alters the future that he'd see. While knowing, guessing or noticing the opponent's next action is a very big advantage in combat, it's not a total advantage. This means that it is possible for the precognitive warrior to predict "ugh, no matter where I strike, she'll manage to block me in time anyway", and afterwards "ugh, in 6 seconds she'll do an attack that I won't be able to avoid - if I strike now, then I'll impale my self, if I dodge now to the left, then she'll strike me this way, if I try to block, then she'll follow up and kill me that way". In a more extreme example, if a precognitive warrior would be under a strategic bomber plane dropping its load in a place with no hard cover, all he'd predict was "In 6 seconds, I'm torn in pieces". It doesn't matter if he can predict her moves unless he can counter them, and it doesn't matter if he can predict her defenses if he can't get through them. If I were in a fight with Mike Tyson, it wouldn't matter if I knew exactly when and where he was going to hit me - I'm not fast enough nor strong enough to do anything about it. If she can physically overpower him, she'll win. If she can't overpower him when he's strong, she'll need to exhaust him until she can. If he's too strong, she shouldn't attack him, but rather make him attack her and react to his movements. If she doesn't move until he does, then he can't predict her movements (short of predicting his own). The "wearing them down" and "poison" strategies are both good answers, they are specific instances of the Checkmate strategy. This is the only way I'm aware of to reliably defeat a precognitive. Essentially you need to adopt a strategy where by the time he becomes aware of it it is already too late to prevent. A simple example for the fight might be to make a leg sweep - so he jumps into the air. As soon as he jumps though he's now exposed to another attack and unable to dodge until he has landed. In another example you might fire multiple bullets at once, arranged so it is impossible to dodge them all. The fan of darts mentioned in one of the other answers is an excellent other example. Essentially you start a sequence of moves that is more than 6 seconds long and where the trap is not visible until the sequence is already in process and where it is too late to stop it at that point. By the time they see the bullets coming, there is already nowhere to dodge. By the time they realize what the fan of darts is for it's too late. By the time the poison takes effect it's too late. By the time they realize they are getting tired it's too late. By the time they see the end of the sequence of blows they are blocking and realize they are about to be forced into a wall it's too late. If a chess grand master sees a check mate coming in 10 moves but there is no longer any way to prevent it then that knowledge does not help him at all. An alternate option comes to mind. Though not as good as poison, it's more devious. Alice can capture one of the warrior's children. She then tells the warrior that if he does not surrender, she will harm the child. If he surrenders, she releases the child immediately, he will then pre-see that surrender will leave his child unharmed. Okay, so far few suggestions have leveraged your intent to end in a draw, but that provides a cute advantage. Consider using a variant of the draw strategy that Star Trek's Data used in a game of Strategema. In brief, since his opponent was more skilled, Data realized that the way to improve his odds was to intentionally play for a draw, since that is better than a loss. The game goes on forever because it is harder to stop a player intent on forcing a stalemate than it is to defeat a player trying to win. This, by the way, has validity in some games. I'm no chess player, but I believe there are many endgame scenarios in which this is a possibility. And precognition really does not enter into the picture. Consider, for example, that chess players are, in fact, both "precognitive" by your definition, because at all stages of play, the game is in a state that resembles many, many other games. Each player has had opportunity to study and all these games and has practiced many of them. That doesn't change the fact that for any potential configuration, each player can think a certain number of steps ahead, and with infinite computational power, a player could devise the ultimate unbeatable strategy. But unbeatable is not the same as winnable; in some cases, the best outcome for two sufficiently advanced opponents can only be a draw. Implementing this is up to you. Grappling? Simultaneously applied pressure points? The gist is that Alice can do something that is not strategic because it leaves her vulnerable, but as long as it results in a draw, you have accomplished a mission. Also, it leaves room for a rematch. If the stakes are higher (to the death? ), she has to solve it differently. It depends a little on your world setting and how fixed your future is. With reliable precognition and a deterministic future - you need something that by the time they've seen it, it's too late. something deceptive, that harms them without them realizing. They 'see' it, but they don't realize it's a problem. Poisoning them is one option, but you can't use a poisoned dart because it's still a weapon. You might need a contact poison, such that an innocuous looking touch becomes a weapon. (Poisons need not be lethal). Something that you can prepare - a trap that you can't avoid within 6s. Something like a net trap - how far can your guy run in 6s from a standing start? Drop a net on him that big, and it doesn't matter where he runs, he's still caught. Or perhaps a corridor/portcullis trap - walks down the corridor, and then block entry/exit. Perhaps a tear gas grenade? By the time he sees you with your gas mask on in 6s time, you've already flooded the space with tear gas. Something overwhelming - lots of attacks to fend off. A bill line, or multiple people with net/bola who are spreading out their attacks. The predictive warrior cannot be anywhere, so apply scorched earth tactic: start to destroy the walls, food, water outside predictive range (etc. shell the walls with explosives) until the nanomachinery fails. If destroying is problematic, use sensory blockage or overload: fog grenade, drive a huge herd of cattle into the place, pay some people to make noise or buy a really loud pet. A human is not able to sense everything so his AI will be useless. Pay several persons to make this from several sides. When the warrior shows up at one point, the persons retreat and try to entice the warrior to leave the AI range. Continue until you have a clear path to the warrior or the warrior comes to you. Both options are inevitable. Move into the predictive range (so outside the sensory blockage or devastation). Once you encounter the target, act surprised and attack him with something like a barrage of arrows. Because the target will be very likely still inside the predictive range, he will be pleased to show you how good the AI is working. Feign panic and flee. What the warrior does not know is that you trapped the return path inconspicously exactly outside the range so that you can run normally. Another option is using a sharpshooter outside the range of the AI. Either the warrior follows you and the (non-lethal) trap is activated or continue your path of destruction until the AI has nothing more to predict with and you are on equal footing. Suru Michi Jiu Jitsu slogan: Gravity Works. Use your environment to defeat him. Find some stairs; catwalks that should have railings. Back'em into the wall of decorative spikes, an open pit of snakes, ect. 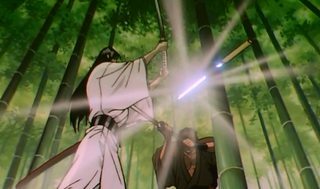 the protagonist defeats a superior, blind swordsmen, by ducking underneath his friend's sword that went flying earlier and got stuck in a tree. It deflects an intended killing blow leaving him wide open. Didn't 'see' that one coming did you? Likewise in Star Wars, emperor Palpatine could not foresee the cause of his own death, probably because it was gravity. As a last resort, challenge him to a battle of wits... and don't forget to brush-up on your iocane immunity. OK, I'm out of movie references -I'll let myself out. Having done a bit of mock fighting, I would say in some cases this works. Shield fighting: that is bash shield against shield with leveraged blows. The object is to beat back and tire opponent. Six second precog wouldn't permit dodging the blows without retreating (or exposing to the sword in the other hand), and they're intended to be blocked so blocking perfectly doesn't really help. It's a simple technique that depends on superior stamina to defeat an opponent. Just be so damn dangerous that precognition doesn't help. I'm in a room, my precognition tells me that in six seconds a bomb is coming through the ceiling. I start to flee the house, but the bomb's too big, the blast kills me. But Alice isn't a bomb. So, I'm in an arena with a lion, my precognition tells me that in six seconds the lion is going to attack. At every stage I know what his next swipe, slash or bite is going to be - but he's enormous, fast, and strong, my knowledge does no good at all and he kills me. So, Alice just has to be that fast, that capable, that strong that all the precognition does is let the enemy have the dubious privilege of experiencing his death twice. It sounds like you went out of your way to create an unbeatable warrior. So maybe she can't beat him in a fight? If she's so ignorant of the local customs she gets into this unwinnable fight, she probably doesn't know enough about the warrior to come up with a strategy to beat it. One answer I haven't seen, is to simply not plan. Deadpool Vs Taskmaster as an example. The Taskmaster is a master combatant, he can memorize someones entire fighting style instantly. He's basically undefeated because of this. He knows what you're going to do before you do it. Unless you don't even know what you're doing. Not the answer you're looking for? Browse other questions tagged artificial-intelligence time combat or ask your own question. How do you assassinate someone who is protected by precognitive people? How to Catch a Dream Thief? How would an intelligent forest control and direct its animal minions? A deadly decadent court of seers. Any ideas on how court intrigue would be altered if every noble and government official could see into the future? How would precognitive aliens deal with not being able to see the future clearly?